In August 2010 when I was lucky enough to have the opportunity to dive the newly opened wreck site of the aircraft carrier HMS Hermes (95) off Sri Lanka's east coast. I never imagined that within a little more than two months I would be again diving on the USS Saratoga (CV-3) aircraft carrier at Bikini Atoll. To my knowledge apart from the USS Oriskany, an aircraft carrier sunk as an artificial reef off Florida, HMS Hermes and USS Saratoga are the only other diveable aircraft carriers in the world. The 'HMS Hermes' was sunk with the loss of 307 men by Japanese bombers in World War II on 9 April 1942, and the 'USS Saratoga' by an atomic explosion at Bikini Atoll just after the war. Bikini Atoll, the world's ultimate wreck diving location, had been closed since the end of 2008. I had been fortunate to dive at Bikini Atoll in 2005 and 2007, and was highly disappointed when fly-in, fly-out dive trips to this bucket-list destination were cancelled. But then in late October 2010, I received an invitation to join a liveaboard scuba diving expedition to Bikini Atoll with a view to re-open it for diving operations in 2011. The invitation came from Martin Daly, owner of the Indies Trader fleet of Surf adventure vessels. My name and Pete Mesley's from New Zealand, had been put to Martin as divers to assist and advise in the planning and setting up of a live aboard dive operation at Bikini Atoll. We both had all of two weeks to reorganise our lives and business and convince our respective wives that this was an opportunity of a lifetime! What else could we do? We were going! The dates were set and we had to be in Kwajalein in the Marshall Islands by 10th November 2010 to board the 'MV Indies Trader', a vessel as famous to surfies around the world as the 'Calypso' is to divers. This was for the 240 nautical mile, 24 hour steam to Bikini Atoll. Martin suggested that there was a few spare bunks aboard and if I knew anyone else I would like to invite I was welcome to do so. Jeff and Bev Giddins, from Scuttlebutt Charters, and Dave Kelly, a Black Rock Dive Club legend, joined the trip. Some great work from Samantha at Dive Adventures had flights booked. Cairns to Guam at 0035 hrs on 8th November with an unavoidable two day stop over in Guam. Pete Mesley flew straight through to Truk to arrange rebreather cylinders and sorb for himself and Jeff. We would pick him up on the 10th on our island hopping trip from Guam via Truk, Kosrae and Ponepae through to Kwajalien where the 'Indies Trader' would be waiting, having steamed from Majuro the previous day. After meeting up at Cairns Airport we proceeded to check in at Continental Airlines where we were informed by staff that we wouldn't be allowed to disembark at Kwajalien unless we had a permit. Kwajalein is a secure American Military Base. I remember on previous trips to Bikini via light aircraft from Majuro stopping at Kwaj to refuel and being escorted by armed guards with dogs to and from a holding area while refueling took place. Having two days in Guam waiting for connecting flights gave Martin and Samantha time to negotiate their way through the Continental bureaucracy and find someone that knew what was required. The Continental representative at Kwaj was the lady's name we had to drop at Guam airport and 10 minutes before departure they let us board the flight to Kwaj. Phone calls from Guam to Kwaj confirmed that we did not need special permits to disembark if we were transiting to a nearby island called Ebai. On arrival at Kwaj we were escorted to transit as per previous experiences. After they had played their games, we were finally escorted to pick up our baggage and driven down to the ferry terminal. Although the 'Indies Trader' was holding just off shore with her tender live and ready to pick us up, we were advised that this would not be allowed as we were in a secure area. We would have to catch the ferry along with all our baggage to the island of Ebai about 30 minutes away where we could then board 'Indies Trader'! This vessel pioneered the surfing industry in Indonesia and being 30 years old, has circumnavigated the globe 4 times in search of new surfing destinations. At 23 metres (76 feet) in length, it is not a large vessel, but is definitely seaworthy. Our first night out from Kwaj the Trade Winds decided to kick in and I had waves washing against my cabin door. This meant timing to go for a late night slash was critical but exciting. Martin reminded us that we were in one of the remotest parts on the globe and to treat the railing as if there was a 20 story drop on the other side. The only other vessels we may see would be long liners as we were well out of shipping lanes. The weather and current was not favourable and we were only making around 7 knots, so the skipper Lee decided to head for the closer Atoll of Rongalap. This would give us a break from the rough conditions before our final run to Bikini Atoll. We arrived at Rongalap late afternoon which as luck would have, it gave us a chance for a spot of fishing before setting off later that evening for Bikini Atoll. With two lines trawling it wasn't long before we had a strike. Two Yellow Fin tuna caught by myself and Edward, our Bikinian guide, and a massive Dogtooth Tuna landed by Pete Mesley, gave us more than enough Sushi and tuna steaks for the rest of the trip. The biggest challenge was to get the catch on board before the sharks had their share. These waters are so remote and the fish life so abundant that very little of it has ever been dived. The Marshall Islands offers some of the last untouched diving in the world. After dinner that night we pulled anchor for our overnight sail to Bikini Atoll. The conditions had abated some, which allowed us to catch up on sleep and we arrived at Bikini around 6:00 a.m.
Bikini Atoll to me is the most beautiful and serene place I have ever visited. The main island, about 10 kms around, is fringed by perfect beaches on the lagoon side and an outer protective reef on the ocean side. It defies the 23 atomic test blasts that took place there from 1946 to 1958. It is to me an absolute paradise, but don't eat the coconuts! Total population of five: two scientific types, with three Bikini Islanders assisting. After sounding and locating the wrecks we planned to dive, we set up our gear for an afternoon dive on the USS Saratoga, or Sara as she is affectionately known. This wreck is absolutely awesome, bigger than the SS President Coolidge in Espiritu Santo, Vanuatu. The USS Saratoga sits upright on the bottom in 50 metres (165 feet) with the flight deck at 28 metres (92 feet), the tower rising to 15 metres (50 feet) with visibility at least 50 metres, and water temp of 29 degrees Celsius (84 degrees Fahrenheit). This checkout dive on Sara is about as good as it gets. Pete and Edward were first in and secured a line to the massive winch at Sara's bow to moor Indies Trader. Dave and I were next, followed by Jeff and Bev and Martin. Twin manifolded cylinders and an 11 litre (90 cubic feet) stage cylinder with 60% nitrox were used. The stage cylinders were left on the flight deck at the bottom of the mooring line to be retrieved on the way back up. On this dive we explored across the flight deck to the starboard side, past the anti-aircraft guns and massive deck guns, to the tower housing the bridge and radio rooms. I noticed that the diver's helmet left on deck since my last trip in 2007 is still there, however the outer plating of the tower has deteriorated. The bridge still has many of the artifacts placed there for divers to see by the previous operator. A swim across the gaping hole that is the forward elevator to the Port side and along to the bow where our deco cylinders are retrieved to complete our 70 minute dive. Back on board Pete Mesley, a veteran of Truk and many other wreck dives, is blown away by the sheer size and potential Sara has to offer. That night we anchored off the island complex and were entertained for several hours by a four metre Manta ray feeding on the goodies attracted by the floodlight at our stern. Over the next 7 days we completed two dives on HIJMS Nagato, 221 metres (725 ft) long. This is the Japanesse battleship from which Admiral Yamamoto commanded and gave the order to attack Pearl Harbour. The guns on HIJMS Nagato are 17 metres (56 ft) long, took a 17 inch (43 cm) diameter shell and weigh 100 tons each. The four massive props are also a sight you will never forget. One dive on the USS Lamson (DD-367) an American Destroyer, 104 metres (341 ft) long. Plus a dive on the USS Apogon (SS-308), an American submarine, 95 metres (312 ft) long sitting upright on the bottom like it's ready to go. This must surely be the best sub dive in the world! One dive on the USS Arkansas (BB-33), 171 metres (562 ft) long battleship that survived two world wars, and a further six dives on Sara, that included exploration of the Dental surgery, Machine shop, Divers locker complete with two more helmets, Combat Control Room and Admiral's Cabin, crockery cabinets and the two planes that rest off the starboard bow, to name just some of it. We never had the time to venture past the Tower and take in the stern area. Lack of time and our schedule prevented us diving some of the other available wrecks at Bikini Atoll. After eight days our time at Bikini Atoll had come to an end and we headed off to Kwalalein and our connecting flight back home, confident in Martin's ability to negotiate the re-opening of Bikini Atoll for dive operations and the knowledge that it won't be long before we can return to what is indisputably the world's premier wreck diving location. 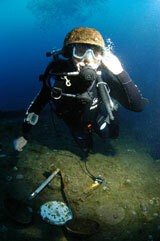 The Scuba Doctor has Bikini Atoll dive expeditions arranged for October 2013 and 2014. The dive trips are ex Cairns and are a 14-day turn around allowing for 1-day steaming from Kwajalein Atoll to Bikini Atoll and 1-day return, plus 10-days of diving for 20 dives. For information on these trips, or if you would like to plan other dates, please contact diveshop@scubadoctor.com.au or phone 03 5985 1700. Trips are limited to 10 divers. Warning: Scuba diving at Bikini Atoll will change you forever. Some divers on earlier expeditions with The Scuba Doctor to Bikini Atoll in earlier years simply stopped diving for a year or more after the trip. Nothing else could measure up after Bikini Atoll. Don't miss out. Book your spot today! A bad day of scuba diving is still better than a good day at work. A representative from Skin Diver magazine recently proclaimed Bikini Atoll as one of the top five dive destinations in the world. This is your chance to see for yourself why.